Ransall is an agricultural, nonindustrial world still lacking adequate means to expand its economy. 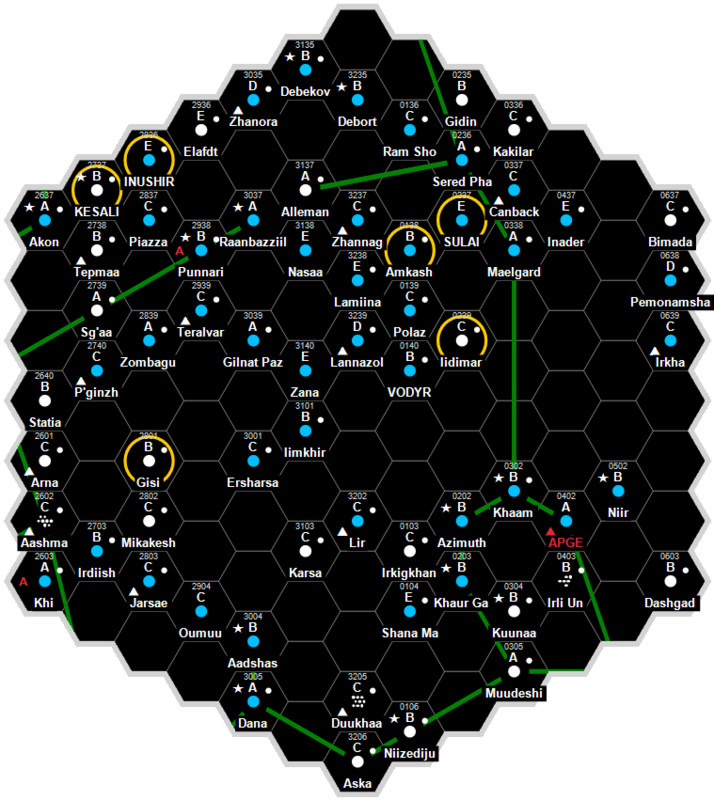 It is a Non-Aligned world dominated by human sophonts located in the Sena Subsector of Halcyon Sector. This world lies on the Elemid Trace Star Lane. The primary is Gallot, an ordinary orange main sequence star. It has a luminosity of 0.064 Sols, a mass of 0.5376 Sols, and a diameter of 778,000 km. (I) Durben is a small gas giant that orbits within the habitable zone: (Ia) Ransall is its largest satellite and is designated the mainworld. (II, III) two rocky vacuum worlds, (IV) a large gas giant, (V) a sparse rocky planetoid belt, (VI) a small gas giant, (VII) a trace atmosphere world, (IX) a sparse icy planetoid belt, and (X) a small icy vacuum world form the outer system. All of the gas giants retain satellites. (I) Durben is a small gas giant that orbits Gallot at a mean distance of 0.16 AU, within the habitable zone, and has an orbital period of 31 days 21 hours. It has a diameter of 33,000km and is a pale green-blue colour. It retains a family of two major satellites of which the outer, (Ib) Ransall, is designated the mainworld. A huge white storm, lying to the south of the equator and covering around 5% of the surface of the planet, has been raging for more than two centuries. Ransall (1422 Halcyon) is a gas giant satellite with an extensive ecosystem. Navanna birds are large avians native to the equatorial forests of Ransall. Their eggs have mildly euphoric properties and are considered a great delicacy. Ransall has a routine quality starport. Ransall possesses a Technology Level of TL–4. Ransall has a Civil Service Bureaucracy government. This page was last modified on 11 December 2017, at 20:36.